This one-of-a-kind treasury brings together the talents of nearly two dozen bestselling middle-grade authors, including Shannon Hale, Brandon Mull, Ally Condie, and Jennifer A. Nielsen, who have created original short stories - modern-day fairy tales - based on the lives and dreams of children they have met who all have two things in common: they have very big hopes and dreams, and they are all cancer patients. Each short story is prefaced by a brief introductory bio of the child and is accompanied by photographs of the child, fully costumed and digitally inserted into a background - a baker, a dancer, a superhero, a dragon fighter, a sports star, a princess and more - that makes them the hero of their own modern-day fairy tale story written by one of their favorite authors. 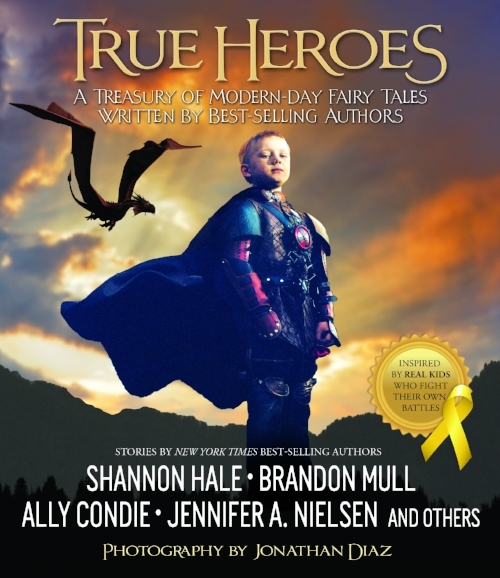 Proceeds from this collection of 21 stories benefit the Anything Can Be project, which fights pediatric cancer.